Now some people don't care for the ways of Alex Jones yet he's one of the few now speaking of such potentials as human activities causing earthquakes. And we know there exist in the world gangs of robbers in hiding and win-at-any-cost brigands (the political arm) and criminals (the enforcing arm) of a network who think it's all about them and scr*w the rest. Then there are religious crazies who imagine they can speed up God's timetable and bring on Armageddon as if they would be somehow benefit from such a self-destructive plan! As if God someday would say, Thanks for the spur, religious zealots, I needed inspiration from you to act because I was wavering on The Plan I created before the Earth was formed. What would I do without your arrogant meddling? Puh! Of course, ego inflation is one of the factors knitting the reptilian-brained together and love of money (the root of all evil) is a driving motivation for them all. Is murder self-loathing turned outward? Fixed Star Denebola (near US natal Neptune 22Vir25) tells such a tale: to go against society which, when the star is active, can affect all dimensions of life from financial fraud and greed to acts of violence in a community, with all manner of selfishness in between. So now, in August 2011 with a New Moon 5Vir27 about to conjoin President Obama's natal Pluto 6Vir59 on the evening of August 28 (11:04 pm edt), we may wonder which side our politicians are on: is it going against society to wish our education system into history's waste bin? Is the immorality of forcing the elderly, hungry children, the impaired, and the ill onto American streets something the Republican Party wants to bring to our nation with their austerity cuts and cold hearted attitudes? We know Washington--through the tyranny of the Federal Reserve Bank--holds our purse strings when it's time to aid Main Street while rewarding Wall Street criminals who freely stroll golden avenues. Are Americans being backed into corners in order to encourage protests in great numbers? It would seem so. Why else has the US government expectantly armed and trained soldiers and police if not to beat and arrest their fellow citizens? The riotous mid-1960s saw the Great Conjunction/s of the revolutionary pair, Uranus and Pluto, which now have reached a square (90 degrees) in their orbits (360 degr) so that intense frustration is obvious yet blocked, societal problems resurface from the 60s era, but obstacles stand in the way of easy resolution. Social unrest and riots are sweeping across the globe and Americans are paying closer attention to sorry politicians than we have in a long time. Is it our turn to rise up? As you know, August 28, 2011 @ 11:00 am edt was set to begin the official ceremony dedicating the Dr. Martin Luther King, Jr Memorial Statue on the Washington Mall, with Dr. King shown emerging from the stone, exalted by the very government that may have been culpable in his assassination. Marking the 48th anniversary of Dr. King's I Have a Dream Speech and the Memorial's Dedication will be postponed until September or October. You may wish to read or listen to his speech @ American Rhetoric. Yes, The Preacher (Jupiter) spoke too plainly, made too much sense, and threatened The Establishment (Saturn) by combining the issues of the Civil Rights Movement, the Anti-War Movement, and a blossoming Workers Rights Movement into one huge collection for Americans who wanted their due--and non-violently, thanks. Yes, Dr. King was too popular and may have presented behind-the-scenes 'king-makers' with a challenge in the US presidential arena if allowed to expand his audience and sentiments. Our freedom documents were of no moment for the plutonians who had changed America's course before by assassination of Lincoln, JFK, and others who'd been more what we-the-people in the majority wanted--and continue to want--to lead our nation. Yet on August 28, 2011, no stormy weather can interfere with the third of three conjunctions from transiting Saturn to US natal Saturn, aka, a Saturn Return, with Saturn ruling, among other things, stone, rock, granite, monuments, and permanence. Why, our Saturn Return may include the bad weather! In addition, accountability, responsibility, restriction, austerity, old age, and other such Saturnian themes remain on our menu as our Exalted in Libra (the Scales of Justice) Saturn returns to its natal spot and thereby repeats its square to US natal Sun (leader; leadership) from July 4, 1776. Below is an image of the US Saturn Return horoscope for August 28, 2011 which becomes exact (partile) @ 5:14;19 am edt in the District of Columbia, with a few basic astro-notes included. And I note that Saturn's delaying function is on display with the MLK Memorial Dedication's postponement! Balsamic Moon phase of Endings with a potential for sneaky behavior by the Dark of the Moon; Hour Jupiter, 10Tau21 at Midheaven (The Goal); ASC 18Leo11 with Mercury 18:50 rising; chart-ruler Sun 4Vir44 in 1st house and part of an Earth Grand Trine between Sun/Venus, Jupiter, and Pluto. 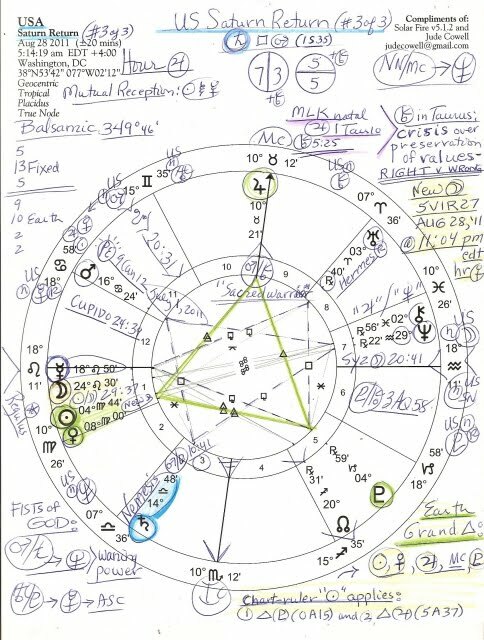 Transit Pluto continues blocking financial progress through Mr. Organized Crime's opposition to US natal planets in business-oriented Cancer: Venus, Jupiter, and soon, the Sun. One Fist of God pattern involves the Uranus/Pluto square of rebellion at its base and both Fists create midpoint pictures which we may wish to consider. The second Fist contains the Mars/Saturn square with both squares separating (waning) yet retaining some measure of power to affect the environment and imprint themselves upon US Saturn Return 2011--a celestial occurrence which is forever imprinted upon the presidency of Barack Obama. Uranus/Pluto = Mercury: adept thinking leads to ideas made real; rational discussions about needs for reform or change; constant focus on new ideas/plans; restless minds; indefatigable workers; resourceful inventors. Chart-ruler Sun in fussy yet dedicated Virgo (which opposes the Progressed Sun 4Pis10 in America's Secondary Full Moon chart of December 2008, conjunct the Sec Moon 4Vir10--this spotlighting hints at Financial Collapse 2008 conditions) forms but two applying aspects in our Saturn Return chart of August 28, 2011. Four planets participate in an Earth Grand Trine, a closed circuit of energies. Actors (planets) within a Grand Trine in Earth signs (Tau, Vir, Cap) prefer the status quo by which they feel supported, and may possess much practical inspiration toward building structures; an amazing amount of endurance is also involved due to the patient qualities of Earth signs. Will credit begin to loosen up soon? Will banksters return the trillions in bailout money to the American people since corporations are reporting huge profits and our economy needs it back? Yet that pair of wastrels and speculators, Jupiter and Neptune, rule and co-rule the chart's 8th house of Shared Resources, Debt, Credit, Corporations, and Transformation through Pisces. 1. trine Pluto (0A15): leadership focuses on power and control issues, and may exhibit skill in handling financial matters; deductive reasoning, such as in detective work or research, may be highlighted; wheat is separated from chaff; scandals may be revealed or spotlighted. As you see, August 28th's protective Jupiter in Taurus sits precisely upon the MC of this chart, the Aspiration Point--next to that, I've penned Martin Luther King's natal Jupiter 1Tau10 and natal Chiron 5Tau25 near this MC indicating that his current Jupiter Return is in progress (a 3-fer: June 10, 2011, Dec 4, 2011 Rx, and Jan 16, 2012 which times his *birthday in Jan 2012 and which is meant to be Jupiter's Reward Cycle.) Some reward! Assassination of an inconvenient man leads to his being chiseled in stone and his memory regaled with the oration of ceremonial speeches some 48 years later by those who only attempt to rise to his oration standards. Now you may wish to explore more astro-factors in the Saturn Return 2011 horoscope for America (since the chart is 'good for' 28 years) and I hope you will. Then feel free to share your insights bwo an on-topic Comment here, as you wish! *Birth data: Martin Luther King, Jr January 15, 1929 12:00 pm CST Atlanta, GA; Rodden Rating A; ASC 13Tau48 where transit Jupiter now pauses; MC 28Cap13--conjunct US natal Pluto, planet of saboteurs and assassins--and Sun 25Cap08 conjunct his m MC from the 9th house side of Religion, Philosophy, and Higher Education; Moon is @ 19Pis35 with Venus in 11th H; chart-ruler Venus is compassionate toward the downtrodden in mystical, psychic sponge Pisces. 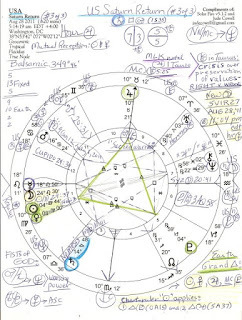 And had he lived, his Uranus Return would be a topic of discussion and of-the-moment with natal Uranus 3Ari57 just inside his n 12th house of Politics and Karma; Uranus in the above chart is @ 3Ari40--Uranus in Aries = radical Utopians, says Ebertin. As you see, Tolkien, Cezanne, and Presley were born with this Sun-Moon blend. To end, here's a quote from Elvis the King which seems apt for the enshrining of Dr. King in stone while America regresses on all the social issues and problems that mattered to him most during his lifetime--while certain political parties, their agents, and shills try very hard to bring back slavery! "It's very hard to live up to an image." No, images are not what's most important under current conditions and a statue can't hire a single worker, sign a paycheck, or construct a factory, can't it? So it must be time for we-the-people to Rebuild The Dream of America! Thank you for your research and hardwodk. I follow your mundane blogs and learned a lot. Especially, thanks to your quotes from Munkasey's midpoint book (and your review on Amazon), now I have another invaluable, much more flexible interpretation tool chest for midpoints. Keep up the good work.